Located in the central Italian region of Abruzzo, Sulmona is a magnificent small town with a population of less than 25,000 people. Although, the Italian capital of Rome is less than a two-hour drive away, it remains largely overlooked by foreign visitors. I love strolling along the town’s main street, Corso Ovidio, flanked by bars and souvenir shops with colorful displays of sugared almond sweets called confetti, that have been made here for many centuries. For a simple lunch, I often pop into a tiny salumeria (butcher shop) to grab a crispy bun filled with olive and truffle paste and slices of cheese or prosciutto ham, all local ingredients. I pay less than $4 for that goodness and devour it outside, on the steps by the ancient aqueduct. For a sit-down lunch with friends, I like going to La Locanda Di Gino where a four-course meal with excellent Abruzzo wine costs $30. When I’m in the mood for pizza I head to pizzeria Kilometro Zero Zero to enjoy delectable pizzas made with strictly local ingredients for only $6 each. 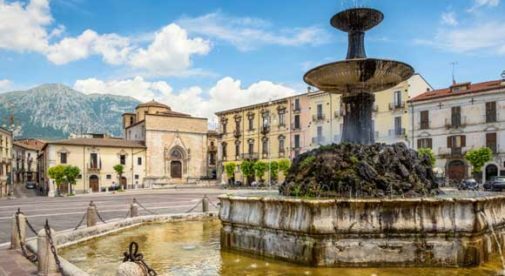 Despite its proximity to the Eternal City, life in Sulmona is not as costly as you might think. A three-bedroom apartment in the historic center can be rented for $520 to $575 a month. In recent years, the town has attracted a steady trickle of expats and retirees from abroad, which is driving property prices up. However, you can still buy an apartment for $90,000 to $150,000 in town. In the small villages within a five- to 10-minute drive, you’ll find beautiful houses that sell for very affordable prices. I found a stone house on three floors with a small garden in the village of Pacentro for $43,000. Another house in Pratola Peligna, a short bus ride from Sulmona, with a terrace and five bedrooms, is on offer for $122,800. There’s plenty of things to do and see in Sulmona too: The municipal theater often has concerts, international opera, and ballet performances. The nearby mountains are criss-crossed with hiking trails and winter sports lovers can enjoy the ski slopes that are within easy reach of town. Every year, thousands of people gather in the historic center to watch the spectacular Giostra Cavalleresca, a medieval festival with horse races, costumed parades, and flag throwing. For Christmas, the town’s cobbled streets light up with festive illumination and become a setting for live nativity scenes. For a change of scenery, you can hop on the train and go to the seaside which is only an hour from Sulmona. Trains to Rome run frequently and only take two-and-a-half hours at a cost of $10 for a single trip. Some years back, George Clooney came to Sulmona for the shooting of his movie The American and any local will inform you how much he loved it here. There are two old ladies selling home-grown fruit and vegetables at the market who will be delighted to tell you how they ended up in the same movie as the Gorgeous George. If you want to rub shoulders with celebrities, despite its Hollywood connections, you won’t find them in this small town. But if you want to enjoy life in the slow lane in a stunning corner of Italy without breaking the bank, this is the place for you.